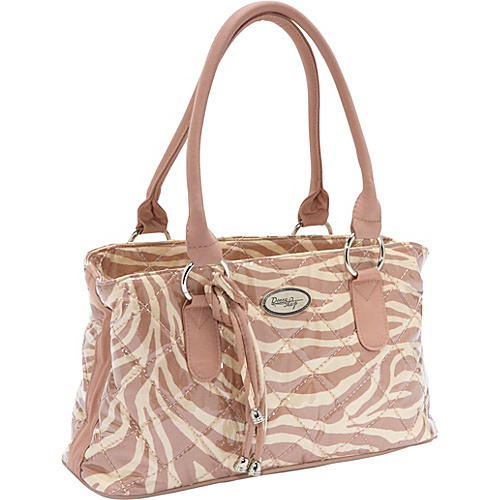 Bring wild, casual, designer style to your ensemble carrying your essentials in the Donna Sharp Reese Bag, Tan Zebra. This lightweight and durable, water-resistant coated cotton tote bag features classic, structured, shopper styling with a zebra print pattern and a logo emblem and tassels. It has a top zip closure, and it boasts a generous, divided and lined interior with a center zip section; a back zip pocket perfect for stashing your keys in; a cell phone pocket; a PDA pocket; and plenty of room for your daily necessities. Its back zip pocket offers additional storage space, and the Donna Sharp Reese Bag, Tan Zebra comes with double shoulder straps.